Looking for a classic lace up Derby but can’t bear boring shoes? Then Derby by Rollie is the perfect choice for you! In a wild array of vibrant colours, textures, and awe-inspiring animal prints, these certainly aren’t designed for the faint hearted! 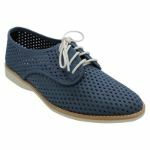 Wear this comfortable Derbys with confidence, and watch heads turn everywhere you go!